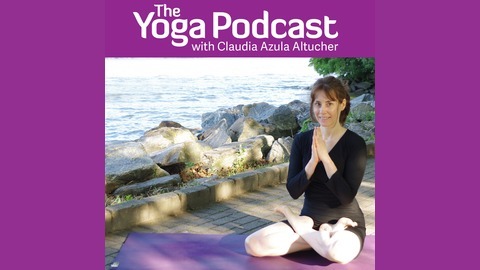 Hi, I'm Claudia Azula Altucher host of The Yoga Podcast. I've been a seeker of yoga for 15 years, and have traveled through India, Thailand and the Americas seeking truth and what works. I am also a writer and author of three books, including "21 Things To Know Before Starting An Ashtanga Yoga Practice", the co-author of the Wall Street Journal Best Selling book "The Power Of No", and the recently released "Become An Idea Machine". I've written for The New York Observer, Positively Positive, Mind Body Green, Yoga Mantra and Health and many other popular websites for the past five years. The Yoga Podcast is a sacred space where I talk with long-term, dedicated practitioners about living yoga with all of its eight branches, practicing, making money through it, teaching it with integrity, learning it with audacity and above all, understanding that nobody needs to be put on a pedestal, because the path to our own truth is lonely and personal, and we must choose the teachings that resonate within. There was talk ranging the whole gamut from Patanjali to Professor Krishnamacharya and his teacher, to BKS Iyengar to Pattabhi Jois (founder of the Ashtanga Vinyasa Yoga System) to BKS Iyengar to Paul Dallaghan, Jessica, Kino... everybody! And he asked me about the Periscope LIVE yoga class I offer for 30" EVERY FRIDAY - Why Periscope? Why should you go into it? How would you benefit from it? Will you like it? Is it for you? And we even talked about relationships, specifically our relationships, and the challenges that we face when working, teaching, dealing with children or step-children and god-children, to cooking and travel, to who packs the clothes and who wins at chess, every time! I don't want to sound arrogant, I prefer to keep it on the humble side, and even that sounds arrogant, I feel I can win. So, ok, what is special about me is I keep it real, I have spent tens of thousands of dollars circling the globe in search of true teachings, good teachers of asana, pranayama, and on lots of meditation retreats. Mostly I am into the flow of life, into living each moment and appreciating the subtleties and nuances of how life is always different, with every breath we take. Yoga is fundamentally a BREATHING practice. And that is the most important part of the message for me. Yoga Podcast Episode #11 - I Had To Go!